Need an Oklahoma Party Band? Call in Big-T and the Bada-Bings! Let’s face it, Oklahoma party bands are few and far between. Almost non-existent, really. Sure, you could get a sleepy little jazz trio, or a campy cover band. But, if you’re looking for something spectacular for your wedding, corporate party, charity gala or private function, look no further than Big-T and the Bada-Bings! 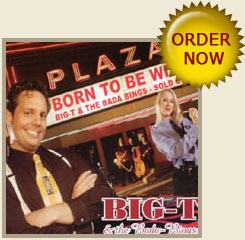 Based in Dallas, Texas, and available as a 10-piece or 17-piece big band, Big-T and the Bada-Bings have earned a reputation for delivering Vegas-quality entertainment that really packs a punch. Bandleader Craig “Big-T” Thompson has the vocal chops to croon like Frank Sinatra and Dean Martin, the gusto to belt out B.B. King, and the swagger to deliver classic rock favorites from artists like Stevie Ray Vaughn. He is backed by a group of masterful musicians, who swing effortlessly from traditional big band to old school blues, rock-and-roll and class rock. 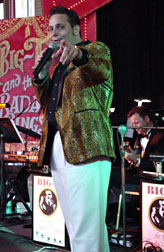 Big-T and the Bada-Bings will turn any event into a night at the Sands! A favorite of wedding coordinators and event planners in Dallas, Austin, San Antonio, Houston and Oklahoma, this big band orchestra is guaranteed to fill the dance floor and bring down the house. Problem solved, pal. Even when you want an Oklahoma Jazz band, just head south of the border to Texas and book Big-T and the Bada-Bings! Want to know more? Move that mouse to the top, my friend, and follow the links to read rave reviews or listen to samples off Big T’s debut CD, Born to Be Wild. This is Vegas-quality entertainment that’s second to none. FUGGHETABOUTIT! ORDER FROM CD BABY“The perfect road trip accessory!